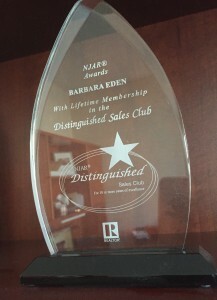 Barbara Eden of REMAX Waterfront REALTORS has recently received the award of Lifetime Membership in the Distinguished Sales Club. This prestigious award is presented to REALTORS® who earn the Circle Of Excellence℠ award for at least ten years. Barbara Eden received the Circle Of Excellence℠ award for ten years due to her exceptional production levels. The Circle of Excellence℠, once called the Million Dollar Sales Club, is a grand achievement in itself. However, Barbara Eden has went above and beyond by achieving this award for over a decade. Her lifetime membership in the Distinguished Sales Club shows her excellence in the field of salesmanship, as well as her dedication and passion for real estate. Whether you are looking to buy a home, rent a home, or sell a home in Port Liberte, you want Barbara Eden on your team. With years of experience and excellence, marked by her Circle Of Excellence℠ awards and lifetime membership in the Distinguished Sales Club, Barbara Eden can help you achieve your goals. Contact Barbara Eden today to ensure success tomorrow.